It is a common belief that self-tanning is the best concept ever. It is snappy, simple, safe and works out incredibly well at giving you that naturally darkened tan you always dreamt about. But, what happens next when you commit this unavoidable mistake during the course of applying it? What first comes to your mind in a situation whereby you wake up in your bed the following day getting to notice splotches here and there? 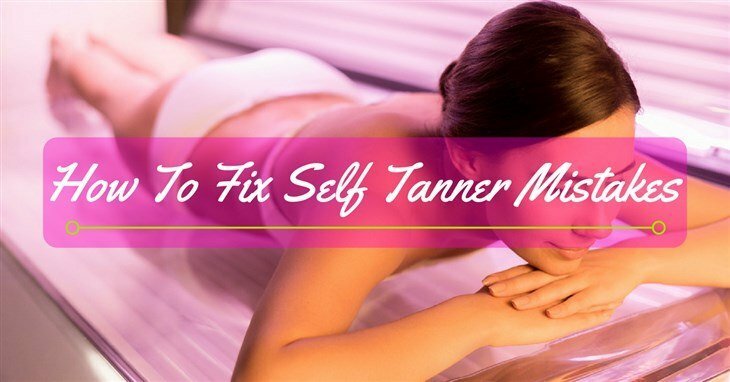 Fear not because here in this article, I shall be discussing how to fix self tanner mistakes that most people commit every day. What's more, the interesting part is that majority of this fix are exceptionally simple to do and cheap. You can personally apply this fixes without the help of any skin specialist. Have you ever come across a self tanner before? Despite the fact that you carefully listened and followed every step about tanning, do you still end up looking more like a striped kitty? Fear not because we shall be looking at tips about the best ways to effectively fix a tanning mistake. Think quick: The quicker you see the streaks building up, the simpler they will be to correct. Consider making use of a fast self tanner so you can able to experience the "uh oh" as they unfold. On the other hand, you can decide to use a gradual self tanner which makes bad outcomes look obvious. Exfoliate: Since tanner tends to dye your skin, attempt to get that pigment remains out by shedding off the skin cells. Regardless of whether you make use of either an old baking soda, body scrub, or a loofah, anyone you use will help new skin cells to surface more quickly. Preparing force: To avoid streaking, you have to firstly exfoliate the skin and ensure your body is not moist while applying your self tanner. Always remember to wear gloves as you rub the tanner into your skin and use a towel to tenderly spread the tanner uniformly, try as much as possible not apply excess tanner to the ankles. Tan removers: Several organizations produce tan remover creams or pads in order to help remove the remains of the dye pigment on the skin. We shall be discussing common self-tanning mistakes and their respective fix, to help you glow the more and make your co-workers to ask you where you really spent your weekend. Either you accept it or not, a fast plunge in the pool will perform the magic. This is as a result of the chlorine present in the water and has the capability to help you lighten your skin tone. You only have to jump into the shower and patiently scrub your body, thereby exfoliating your skin. If your skin looks orange, that means you are definitely making use of a wrong formula of DHA which can be regarded as a colorless sugar which associates with the dead or damaged skin cells present in the epidermis outer layer and tends to change the tone of your skin. The measure of DHA (dihydroxyacetone) differs from one self tanner to another. With varieties of self tanner products available in the market today, there is one which is appropriate for your skin complexion. It will only take some experimentation to discover it. Get a shower and exfoliate your skin using a good body polish which is far better than conventional body scrub because of its fine beads. These beads won't strip or tear the skin, however, they'll help level out your skin complexion. Search for the right formula. You can always apply a liquid bronzer along with your normal body moisturizer to help blend and correct streaks whenever the skin is dry. If after the tanning you noticed that your hands turned out to look darker than the remaining of your body, attempt the DIY lightener: Do a mixture of 2 spoons of lemon juice, 1/2 spoon of water and 1 spoon of baking powder until it forms a paste. Rub it on your hands for around three minutes, afterward wipe It out with a warm washcloth. Repeat each step if needs arise. If you notice that your hands are becoming too light, simply apply the self tanner again and rub normal skin moisturizer on your wrists in order to help blur your darker skin into your lighter skin. Get a good self tanning spray having a nozzle applicator of 360-degree, so you can rotate it around. You can also get someone to help you out with the tanning. Another choice is to buy a back applicator and attach a body brush to it using a rubber band in order to aim hard-to- touch area of the body. Do a mixture with 2 spoons of lemon juice, 1 spoon of baking powder and 1/2 spoon of water until a paste is formed. Rub the paste on the affected regions for around three minutes, and afterward wipe it out with a warm washcloth. Repeat this steps. Do a pretreat of the self tanner strain using a blend of clothing cleanser and water. Then, soak the affected pillowcase or cloth into the solution for at least 15 minutes before moving it to the washing machine. If the stain doesn't come out still, treat it using glycerin from any drug store Glycerin serves as a stain remover which tends to separates the self tanner dyes. For a white pillowcase and cloth, pour a minute solution of hydrogen peroxid﻿﻿e on the stain to lighten the affected clothe. So there you have it… We believe you have really gotten a lot of intriguing information from this article. Self tanning is amazing, but we commit mistakes once in a while during the course of the application. Successful reading of this article is a little cost to pay. With the tips in this article, you'll be certain noticing you look tanned and breathtaking, and you can effectively fix those little irritating spots and streaks we may now and then get as a result of tanning. Have you ever fix any self tanner mistake before? Do you have any other fix or tips to share? If so, you can leave us a comment below! We would love to hear from you. How To Look Older With Makeup: 6 Awesome Tips You Need To Know! Does Vaseline Help Eyebrows Grow: The Truth About Vaseline You Need To Know! I have a strong passion for skincare. Because of my sensitive skin, I spent many times to research carefully about the high-quality skincare products and tanning lotions. Then, I run a blog named: Find More Beauty to provide my readers with useful tips, best tanning practices as well as all my knowledge and experiences of skincare. Best Travel Hair Dryers To Add To Your Travel Must-Haves! How To Get Rid Of Sideburns? 3 Tips For Doing The Right Way! How To Tone Hair: 3 Methods You Can’t Afford To Miss! Findmorebeauty.com is a participant in the Amazon Services LLC Associates Program, an affiliate advertising program designed to provide a means for sites to earn advertising fees by advertising and linking to Amazon.com. Additionally, Findmorebeauty.com participates in various other affiliate programs, and we sometimes get a commission through purchases made through our links.